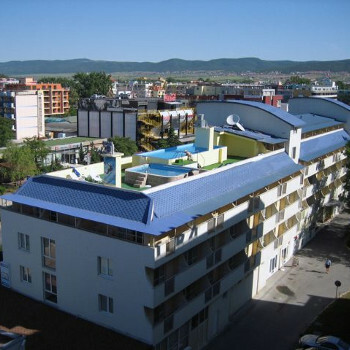 This centrally located hotel is open all year around and is positioned along the main road, stretching through the resort and connecting Nessebur and St.Vlas. There is a post office, bank, polyclinic, resort market and a number of restaurants nearby. Rooms were not very clean and had to ask for clean bedding and towels The restaurant was filthy, tablecloths were stained, cobwebs in every corner. I was served soup in a bowl with two chips on the rim. Floors didn't get swept. Food the worst I've had in a hotel. Buffet style breakfast was ok but the same everyday. Evening meal was a joke! A set menu of chicken, pork, fish,with either mash or chips. Location good next to centre. Staff not bad, got a few smiles now and again. Pool filthy and floor round pool is a accident waiting to happen. The hotel in general was clean as were the rooms. Communication was sometimes difficult. The breakfasts were ok with a choice of their idea of an english breakfast or a continental breakfast. English breakfast was rubbery fried or boiled eggs, cold beans,bacon sometimes, and tinned sausages.... if there was any left. Evening meal was terrible, always chicken wings or drumsticks, some sort of pork stew, potatoes,rice,shredded cabbage,tomatoes and meatballs on occassion.... if there was any left. Be prepared to queue in order for them to bring some more food out. Tea and coffee are help your self from machine. Coffee is ok but tea is not english tea. Sometimes it is just perfumed water. Swimming pool is good as is the plunge pool. Staff find it hard to smile. We were kept up by the disco noice til about 3 am most nights. *Room large and clean. Modern. We had Free aircon. English TV channels in room. Fridge in room. Hairdryer in shower room. No Tea making so take a kettle if you want a brew! The Hotel was clean! Towels could of been changed more regular! The food for breakfast was quite bad but hay its not the be all and end all of the holiday!! I was very wary of going to this hotel as it does look rubbish from the outside but inside it was a very high 3 star if they made a few alterations it could be a 4 star, the attitude of the staff was rubbish, and the porter wanted a tip for taking our bags from the reception to the lift but he didnt get one, ha ha. But the room was good had all your key things for having a good holiday, location was quite good, the hotel is mainly for low budget holiday i would say and not for families mainly for young people like myself. The resort was not what i expected it was amazing had all your bars and clubs you need and the shopping aint too bad, the happy hours are even better the beaches are a bit of a rip off!! but dont eat on the main strip the price of food doubles if not triple and it isnt that good, go down the back roads, the people are alot nicer aswell, the bulgarians dont like the english at all they favour the germans, but i dont know why that is!!! i found them very rude!! no offence!! But overall i had a fantastic holiday and dont believe what you read on here people come on here to moan so i thourght i would tell it as it is, and it is a great place and people dont get mugged as much as they say, its just the stupid that dont have no street awareness!!! Honestly have a brilliant time because i did!!!!! There was an excellent offer for one week's B&B that brought me to the Royal Central Hotel, and so I travelled by bus from Varna where I was staying to the hotel which was located within three minutes walk from the bus station. I found the food to be of a very good standard, and good value, so good that I often came and dined in the hotel again in the evening. The room I had was directly above the reception area and was both faultless and spotless. The elderley lady that cleaned my room every day spoke no English, but when I spoke to her in Bulgarian, her face lit up. I think I made a friend for life, or at least the rest of the week, from that moment. The upstairs swimming-pool, more like a splash pool, is not the place to plan to spend the day. But why would you as you are only minutes from the beach, and all that the Black sea has to offer. Overall, I found the rooms to be excellent, good food, friendly staff, excellent value, marvellous location. The hotel has about the best location possible, as it is what it says, central, and very handy to everything. I recomment it without any hesitation at all. Needless to say, I'm planning a return stay at the Royal Central Hotel for this year. Travel operator: British Airways. (Independent Traveller). my grand daughter and i had a super time last year in the royal central,so much so 11 of us are going in august for my grand daughters 21st.. its my 20th time in sunny beach i love the place and central is in a good spot.The staff, food ,cleanliness and rooms are great.Well done to all who run the hotel.althugh it is in the center of the resort i must say i never had a disturbed night .BY THE WAY THEY MAKE EXCELLANT COCKTAILS.and cheap. if you are interested in a nice buget holiday then you have found it try the royal central. HAVE A GREAT HOLIDAY .